Explanation: Can one galaxy hide behind another? Not in the case of SDP.81. 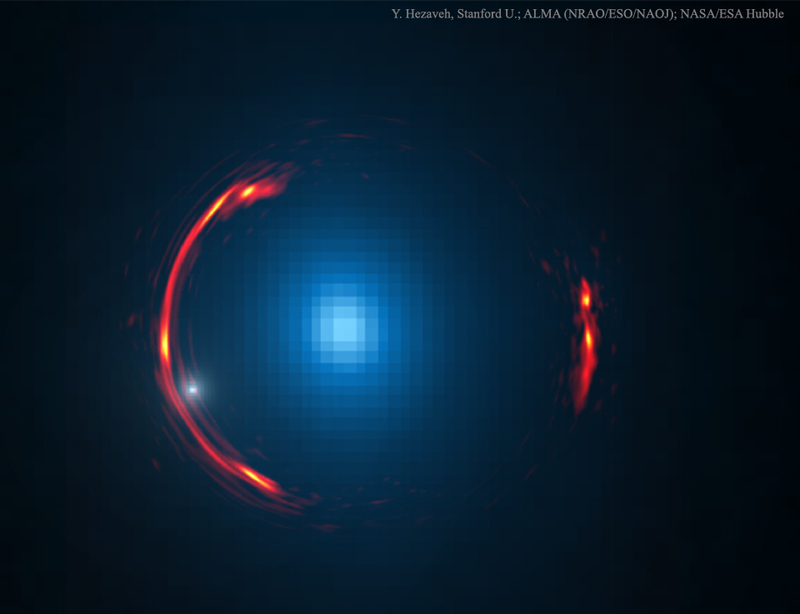 Here the foreground galaxy, shown in blue in an image taken by the Hubble Space Telescope, acts like a huge gravitational lens, pulling light from a background galaxy, shown in red in an image taken in radio waves by the Atacama Large Millimetre Array (ALMA), around it, keeping it visible. The alignment is so precise that the distant galaxy is distorted into part of a ring around the foreground galaxy, a formation known as an Einstein ring. Detailed analysis of the gravitational lens distortions indicate that a small dark satellite galaxy participates in the deflections, bolstering indication that many satellite galaxies are quite dim and dominated by dark matter. That small galaxy is depicted by a small white dot on the left. Although spanning only a few arcseconds, the featured Einstein ring is really tens of thousands of light years across. Comments, questions? Just click the Discuss link two lines below.